Faheem’s Fast Food has legendary status amongst residents in the Newtown area as well as the expatriate Pakistani community. This place is halaal heaven. I've never been to Pakistan to sample their fine street food but at least Faheem's Fast Food in Enmore is here to give me a taste of what I am missing. Faheem's is legendary amongst Newtown\Enmore residents, Pakistani expats and a legion of taxi drivers. They have been churning out fine curries, tandoori and breads since at least the early 1990's, which is when I first remember staggering in after a night the Vic on the Park hotel. We have learnt from the locals that the best way to eat here is to get one or two curries and a mountain of naan bread, it's best enjoyed as a hands-on dipping kinda feed. The naan bread is brilliant, always fresh from the tandoor, none of that bainmarie tomfoolery. And clear your mind of butter chicken, get into the house specialties such as the King of Curries (as featured on Mauve O'Mara's Food Safari on SBS TV). 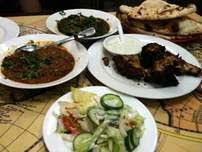 We go for the veggie dishes, they do some mean daals and I am hooked on the palek paneer. We are carnivorous but just really dig veggie food from this part of the world. See our more recent Faheems post here. The naan here is sublime.